I have partnered with At Home as a member of the At Home Inspiration Team for this sponsored post and am happy to share some of my favorite products with you! All opinions are mine alone. 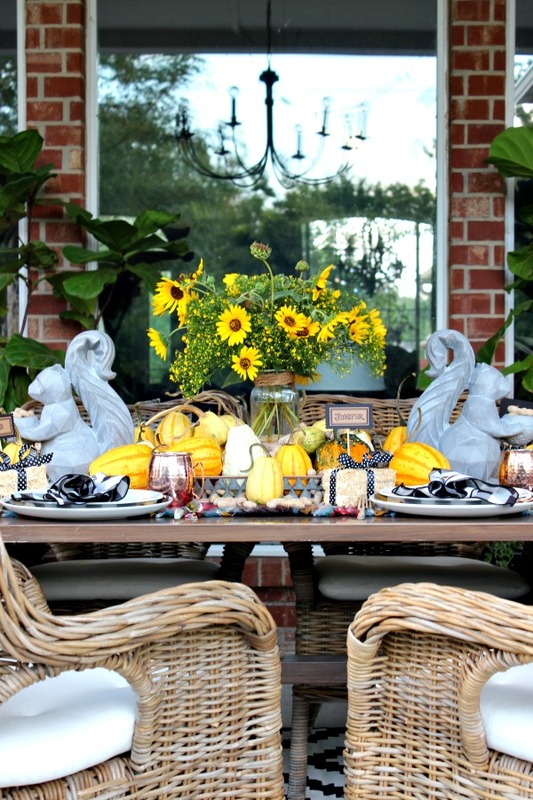 Now that we have a great outdoor dining area on our new patio, I thought it would be so fun to set up a Fall harvest tablescape outside. 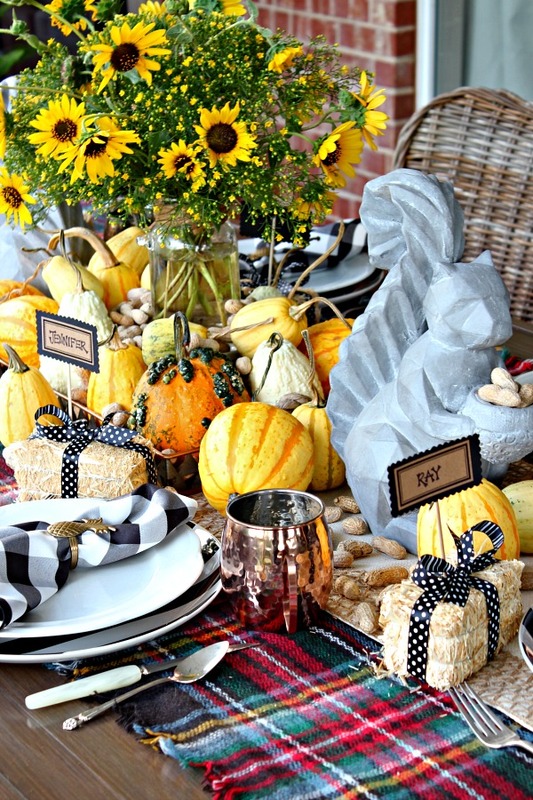 I headed to my local At Home store for some seasonal inspiration, and I wasn't disappointed! As soon as I saw this modern squirrel statue, I knew he had to be the jumping off point for my table. 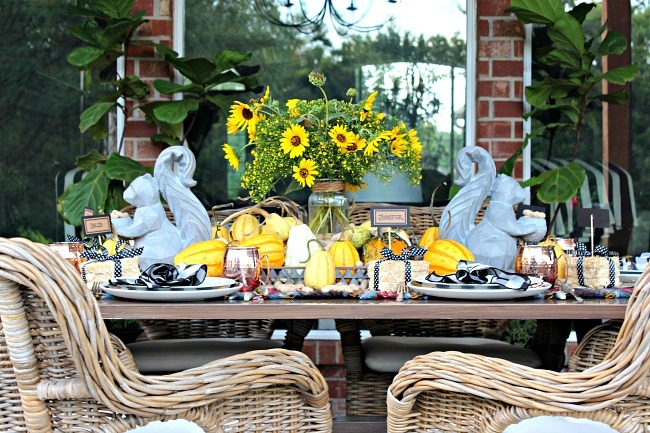 He was just too cute to pass up and I love that he's an outdoor accessory that I can use elsewhere on the patio or tucked in a flowerbed long after this tablescape is gone. 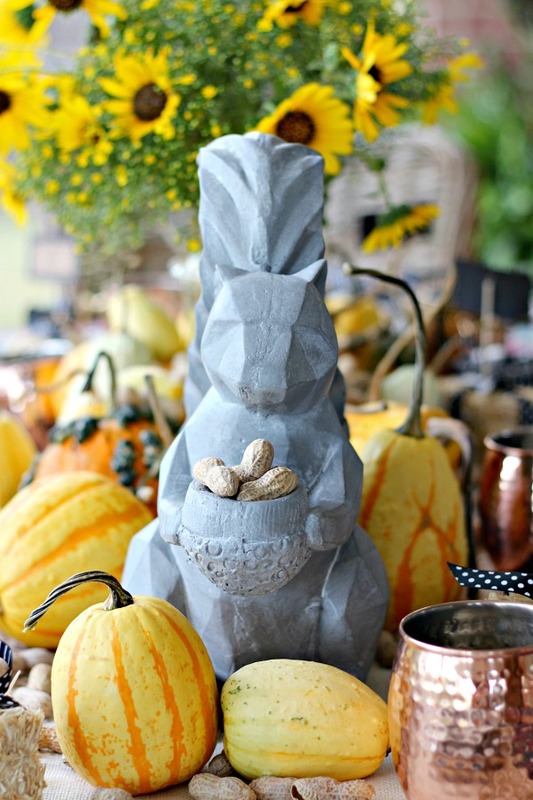 He's holding a darling little scooped out acorn, perfect for a votive candle or filling with treats like I did with the peanuts... it was a toss up between those and candy corn! 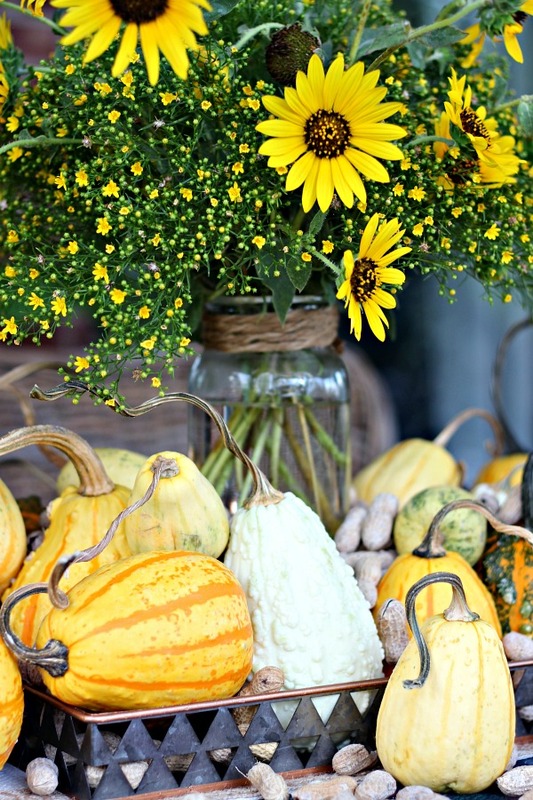 For the centerpiece, I used a simple glass jar filled with roadside sunflowers and pretty filler weeds(?) flowers, propped on a small cake pedestal to add some height. 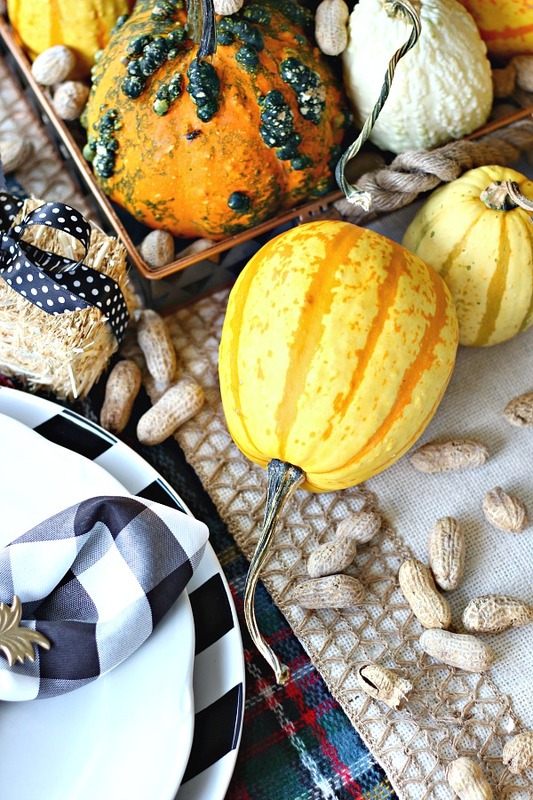 Small pumpkins are corralled and piled on a galvanized metal tray. I almost picked up a simple galvanized tray, then my sister spotted this one with the cool geometric cut out pattern on the sides, and the copper trim makes it even more special. Not shown are the chunky rope handles that add even more texture and interest. I couldn't find a link to this one online, but there are several different sizes and they should be available in store. As a base layer for the table, I started by spreading out a plaid scarf for a runner, then layered this pretty burlap braid table runner on top of it. 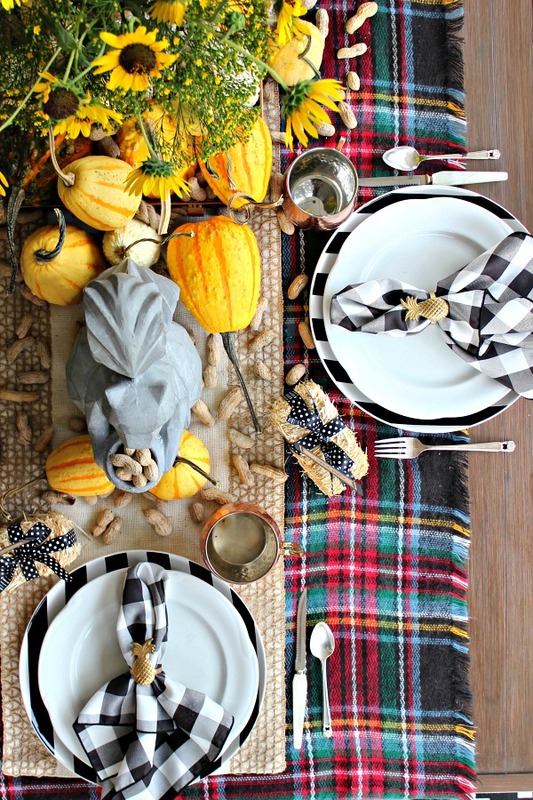 I mixed in some of my favorite black and white patterns on the place setting, and although there's a lot of pattern and color going on, I think it all relates well together. 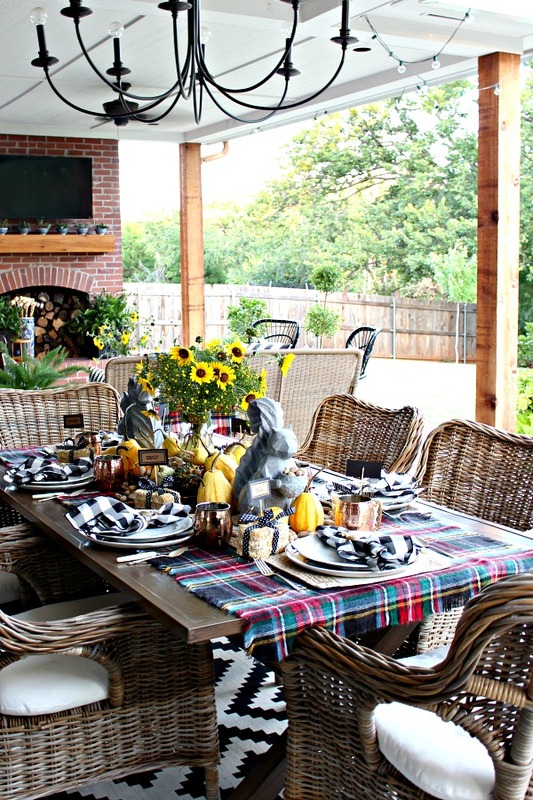 Fall is all about piling on the cozy plaids and patterns! I've said before and I'll say it again, I LOVE mixing metals in the Fall. I've put together the dark pewter/copper on the tray, used silver flatware, and pulled in copper mugs instead of regular glasses. 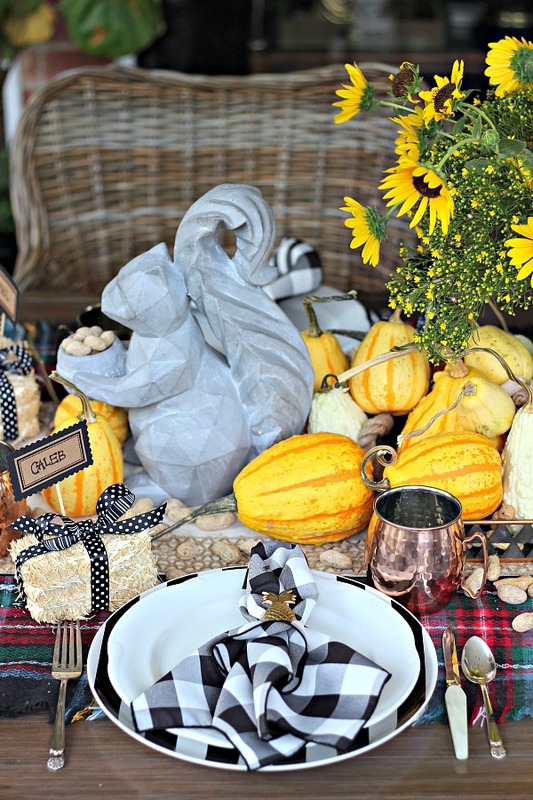 Each place is finished off with a mini straw bale serving as a place card. I used some craft supplies I had on hand and glued each name card to a wooden skewer to insert into the bale. 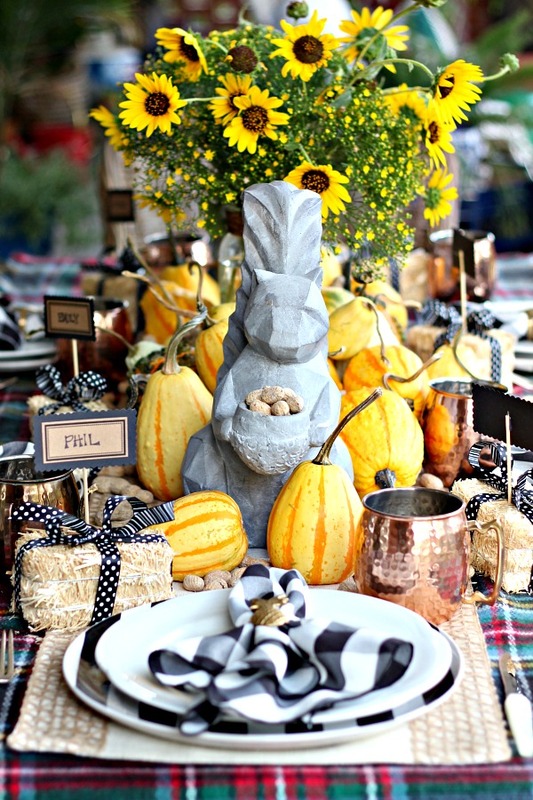 When I found the squirrels I had a cabin, "lodge-y" theme in mind, so the plaid, burlap, mixed metals, a variety of colors and textures, and a nod to some older items with the flatware and vintage steak knives all played together to accomplish the look. Although I didn't use too many of these traditional "Fall" colors of orange, yellow, and brown inside the house very much this year, I sure and enjoying them out on the patio! sooo pretty! 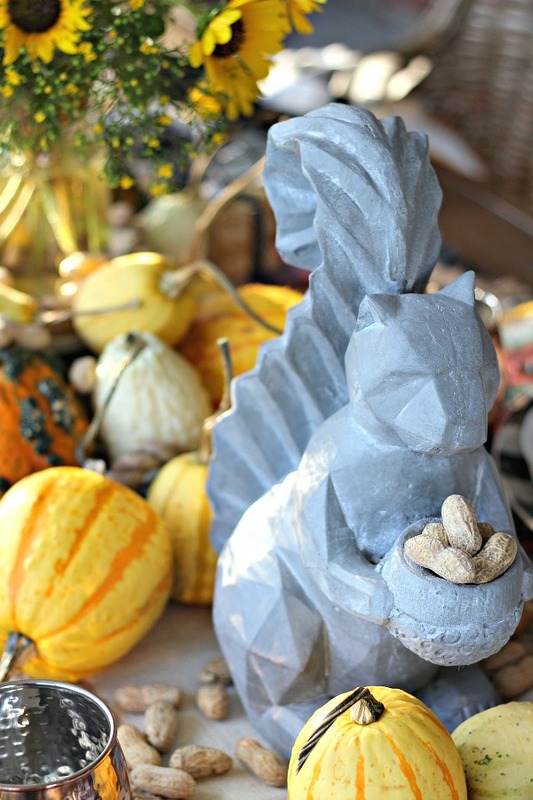 i love the squirrels- they have a jonathan adler feel to me, but i love them in the concrete look! Yes they do, especially if I painted them a glossy white! I thought about a paint job, but am liking them as is for now! Yes you do! They're so fun to have on hand and double as a darling vase! I know this post didn't have anything to do with it--but it's how my brain works when I read blogs...looking and thinking. Where is the best place (price and option wise) to buy modern light bulbs? Wow Jennifer!!! 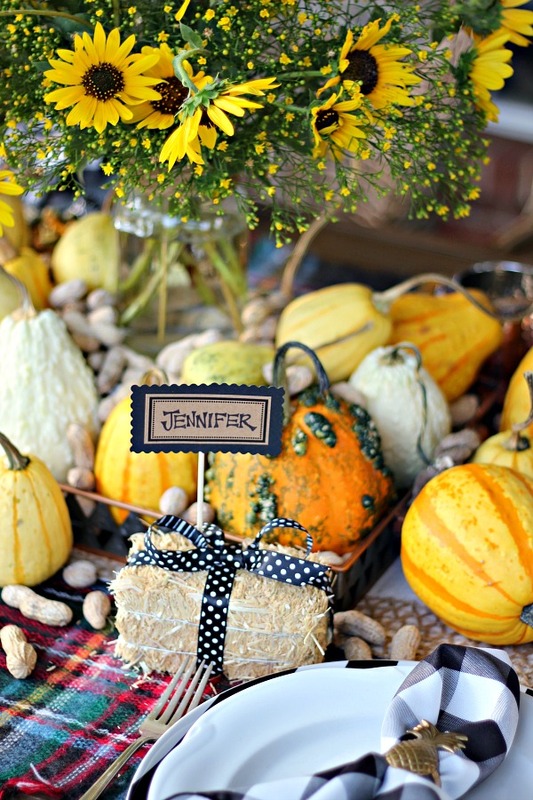 Gorgeous eclectic fall harvest tablescape!!!! So beautiful and I love the mix of metals for fall too. This is absolutely gorgeous and makes me want to have a party. I might need those squirrels! OMG, I missed those squirrels last time I was there! Love them and the whole setting is just perfection! But those pineapple napkin rings!! Do you mind sharing your source? Thank you! Where can I get those squirrels? Found this on Pinterest and had to say I SO love your patio! It is just the prettiest ever! Love those squirrels, wish they were still available. Have a great weekend, Jennifer.